offered participants jobs and internships upon program completion. Woodruff and Shrubb agree that seeing students graduate from the program is one of the most rewarding aspects of DRAGG. "I love the school year because we get to do all of these things with the kids, but the best part is the end of the school year when we get to see parents so proud of their children," Shrubb says. "It's a lot of work, but when you see kids in the program go to college and approach you to tell you how well they're doing, it's all worth it," adds Woodruff, who loves seeing students return to DRAGG to talk about their experiences and success. 'Fastest Police Car on the Street' Getting DRAGG off the ground wasn't easy. Woodruff and Shrubb didn't gain funding until two-and-a-half years after they drafted their idea in 2008. They wrote many grants and proposals and even went door-to-door to recruit sponsors. "The hardest thing for us was the real- ization that it wasn't going to happen over- night," Woodruff says. Both auto enthusiasts, the law enforce- ment duo's initial idea didn't involve an instructor-taught program, but rather just building a cool vehicle to raise awareness about gangs, graffiti and other common issues in Oxnard. 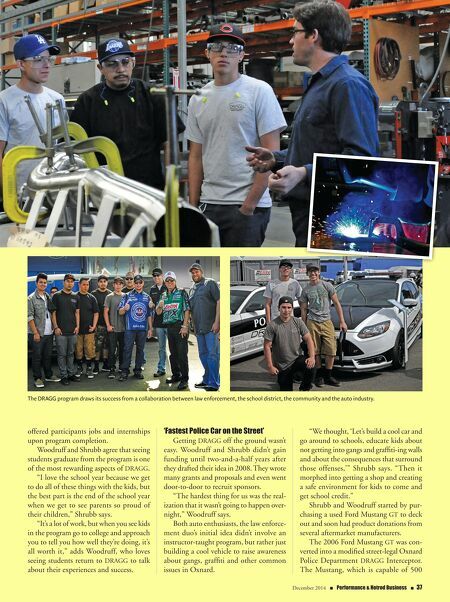 "We thought, 'Let's build a cool car and go around to schools, educate kids about not getting into gangs and graffiti-ing walls and about the consequences that surround those offenses,'" Shrubb says. "Then it morphed into getting a shop and creating a safe environment for kids to come and get school credit." Shrubb and Woodruff started by pur- chasing a used Ford Mustang GT to deck out and soon had product donations from several aftermarket manufacturers. The 2006 Ford Mustang GT was con- verted into a modified street-legal Oxnard Police Department DRAGG Interceptor. 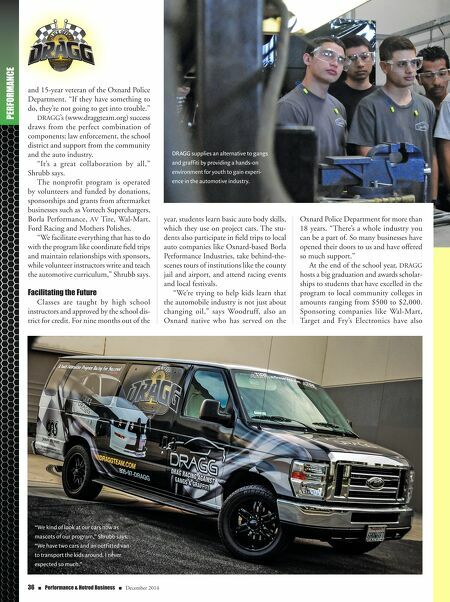 The Mustang, which is capable of 500 December 2014 n Performance & Hotrod Business n 37 The DRAGG program draws its success from a collaboration between law enforcement, the school district, the community and the auto industry.